Hardwood flooring is usually a big, one-time purchase for homeowners. 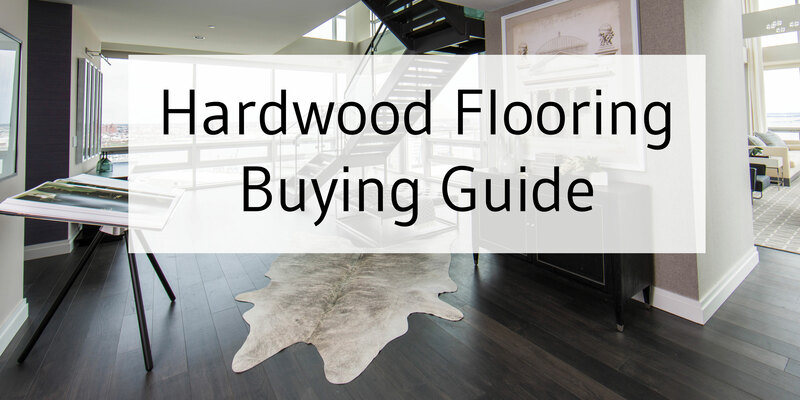 Today, there are so many different options that Tesoro Woods has created a hardwood flooring buying guide. One of the first thing to decide when purchasing wood flooring is to decide between solid or engineered flooring. More often than not, your site conditions will make this decision for you. If you have a concrete subfloor you will likely have to use an engineered wood, because it can be glued or floated to or over the concrete. Solid wood flooring must be nailed down. Nailing into concrete is just not possible. Solid wood flooring is exactly what you think it is, one solid piece of wood. Because it’s one piece, solid hardwood flooring is more susceptible to changes in temperature and humidity, especially in wide widths. The conventional wisdom is that solid hardwood is better because it can be sanded down refinished more times than engineered wood flooring. However, modern factory applied finishes make refinishing a very rare necessity. In reality, most people will move or change the flooring before it ever needs refinishing. Solid wood flooring is also less sustainable, and often more expensive than engineered wood, because it uses more of the premium, expensive lumber. Engineered wood flooring is real wood flooring that’s usually made from a multi-layer softwood base, and a hardwood veneer. Because of its layers, engineered wood flooring is more dimensionally stable (resistant to changes in temperature and humidity), and can be installed on virtually any substrate. Even radiant heat, with approved species. One of the common misconceptions about engineered wood is that it can’t be sanded down and refinished (see above about refinishing). Should you find that your floors need to be refinished, the number of potential refinishings will depending on the thickness of the wear layer, and the skill of your refinishing professional. There are also “dustless refinishing” and resurfacing options, that do not remove any wood, and are much less impactful on your home. Ultimately, whether or not the floor can be refinished is not a useful precept on which to choose a floor. Flooring is fashion, and you should decide which floor to buy, on whether you like the look and style of the floor. See below for more guidance on what makes floors visually different. Choosing the right color and species of wood flooring for you is strictly a matter of your style, budget and personal preference. Wood floors are categorized by three general types: light, medium, and dark. Hardwood flooring can come in a variety of different colors, white, yellow, gray, brown, red, orange, and so on! Many of these colors are the result of a factory applied stain. One of the most popular design options over the last few years is gray floors. Learn more about this year’s flooring trends, here. Another option is to leave the wood natural and unstained. The images above are all natural and unstained. Natural wood tones are more likely to change color and shade with exposure to light, but there really is nothing more beautiful than natural aged wood. The wood species also has a big impact on how your hardwood flooring will look. Exotic species are usually more red or orange in color, while Maple is very yellow and Walnut is a dark brown naturally. Different species will also have very different graining (the lines you see in wood flooring), even before the flooring has been cut and milled. Maples have more muted grain patterns, while Oaks and Hickories have more strong, dramatic grain patterns. All species will have knots and mineral streaks. Although, lumber manufacturers often sort lumber into different “grade” by the appearance of natural character in the wood, such as knots, edge grain, sap-wood, mineral streaks, and holes. Different methods of milling will also have an effect on the appearance of the grain. Rift & Quarter, sawn face, sliced, and rotary peeled to name a few. Most of the bargain priced engineered wood on the market is rotary peeled, which gives a stretched and distorted grain pattern. The overall thickness of an engineered wood floor, has very little bearing on the performance of the floor. A thicker veneer, and more layers of substrate are most critical in dimensional stability of the floor. I.e. limiting expansion and contraction, and making the floor more suitable for different climate conditions. It is best to choose the thickest wear layer you can afford. However, it really won’t make that much difference. Learn more about wear layers here. Wood hardness varies greatly depending on the species of wood. The most common measure of wood hardness is the Janka Scale. This is a measure of wood species density, or resistance to denting. It is not the be all, end all of wood durability. Pine and Walnut tend to be softer and more vulnerable to scratches and dents, while many exotics or Hickory are denser. Look for the Janka rating in the product specifications to determine the hardness of a particular species of wood. But also keep in mind that janka hardness is not the be all, end all of wood durability. For example, Maple, and Brazilian cherry are technically much harder than Oak. Yet because of Oak’s strong grain pattern it hides scratches and dents much better than Maple or Brazillian cherry. What’s more the finish on most woof floors are very similar, and will all scratch to roughly the same degree. Regardless of a wood’s “hardness”. Again, the Janka scale is a guideline. It should not be used as a sole decision factor. What is often referred to as wood grain, is actually the markers of annual growth of a tree, or rings. (insert image of tree rings) Each ring is the end of a year’s growth, usually the winter, in colder climates. Exotic wood species, have less visible grain, because they have a year-round growing season. Rift & Quartered: Rift and Quartered is commonly known for its traditional long-lined grain. It’s usually straight lines that are very close together with wavy lines, or flecks randomly. Read more about rift and quartered grain here. Mixed: A true mix of different flooring grains. Some boards have a straight, vertical lined grain, while other boards have a cathedral grain or flat grain, more of an arching pattern. Lumber mills and flooring manufacturers often sort lumber into different grades by the appearance of natural character in the wood, such as knots, edge grain, sap-wood, mineral streaks, and holes. Rustic: With the appearance of classic early American plank flooring, rustic wood flooring includes knots, cracks, color variation and other natural character. Select: Flooring boards that have been hand selected due to their uniform color and little knots, cracks, color variation and other natural character. There are several other grades than what we have listed here, but these are the most common. Square: A clean-lined, uniform look with a crisp finish that looks very traditional and like a site-finished floor. Both the Great Northern Woods Collection and the Great Southern Woods Collection offer square edges and ends. Beveled: Deeper indent that can hide irregularities in the subfloor while providing a more rustic look.​ The Coastal Lowlands Collection, Brushed Patina Collection, Salvaged Pine Collection and the Coastal Inlet Collection offer beveled edges and ends. Oiled: With a real wood feel, natural oil finishes are safe in homes and spots can easily be repaired with a simple application of more natural oil. Oil finishes have increased in popularity over the years mainly due to a movement towards low sheens and more natural aesthetics. The Brushed Patina Collection features oiled finished floors. Urethane: A water-based, modern day finish that limits chemicals and VOCs in homes. Aluminum Oxide: Aluminum oxide is a naturally occurring element, typically found in a crystal form, and used as an abrasive for sandpaper. It is ground up and the powder is used as an additive to water-based urethane finishes that’s designed to add a hard, durable, scratch resistant layer. Additionally, UV-cured aluminum oxide finishes, which are modified urethane finishes, are often well-tolerated, even by chemically sensitive individuals. Gloss levels indicate how much shine is visible on hardwood floors. Gloss doesn’t impact durability, just the look of a wood floor. The three types of gloss levels are high gloss, semi-gloss or satin gloss, and matte gloss. Keep in mind that high gloss levels will show dust more than low gloss. Please be sure to always review several flooring samples, not just images before purchasing; wood is a natural product and each piece varies.